After the chaos of the holiday season, and with January right around the corner, what’s a better way to ring in the new year than with a decluttered home? With a “new year, new me” mentality, a good, deep purge in every room of your house will put you ahead of all your spring cleaning friends. Check out some of these tips and tricks on how to declutter your home for the new year. The best way to get started is by tackling your home room by room. 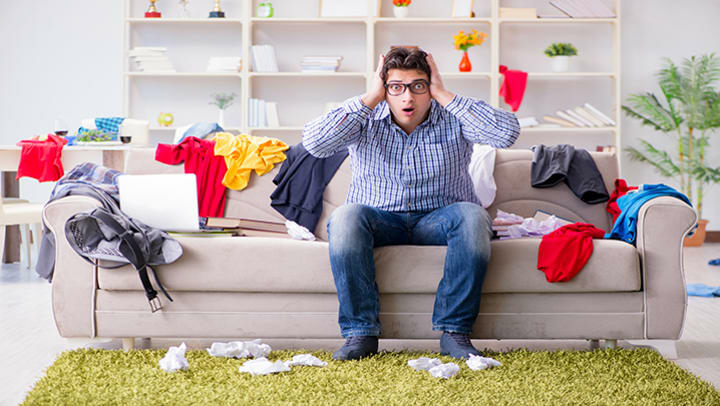 Focusing on one room at a time will help keep you sane and organized as you declutter. The living room can be one of the trickiest places to keep organized and clean with all of the foot traffic it gets. If your family spends most of your time together in the living room, then you’ve probably fallen victim to the “flat surface curse.” Flat surfaces are a cluttered mess waiting to happen, especially bookshelves and coffee tables. Carefully curate what you want to display on your shelves and coffee table. Anything you no longer love, donate or put in storage. If you have kids, your living room is likely home to most of their toys. Buy a basket that they can fill up with toys they play with most. This will keep the number of toys in the living room limited and contained so that you can keep the space organized. Drawers and cabinets are a disaster waiting to happen. Everyone has that one kitchen drawer that’s filled with junk, right? The best way to declutter the kitchen is by investing in plenty of drawer organizers and inserts. Clean out each one of your kitchen drawers and get rid of anything that’s old, worn out, or just doesn’t belong in the kitchen. Use the drawer organizers and inserts to organize your drawers in a way that you’ll be able to find everything. If your countertops seem to collect clutter, buy a few canisters, trays, or utensil holders that will eliminate things being strewn across the counter. This will also help declutter your cabinets. Canisters can hold basic baking ingredients like flour, and your trays can hold things like coffee and tea. It’s an inexpensive way to add some more storage, but it also helps bring some pop to your kitchen with the added decor. When you think bedroom clutter, what usually comes to mind? Clothes! It’s easy to just throw our clothes into our drawers and closets because it’s the easiest way to get things out of sight. Out of sight, out of mind, right? When decluttering your bedroom, use the one-year rule. If you haven't worn that item of clothing in a year, donate it. This will add more space for the things you actually wear. Shoes are one of the biggest problems in closet organization. It’s hard to keep them all organized, especially if you share a closet with someone else. The best way to organize your shoes is to buy a clear shoe box to store the shoes you don’t wear that often. Then, get a shoe rack to keep the shoes you do wear frequently. At the end of the season, you can always switch the shoes out so you have easier access to them. Bathrooms are usually the smallest rooms in the home, and often the messiest. With all of our beauty products, medicine, and other toiletries, it’s hard to keep the counters clear and the cabinets clean. The best rule of thumb is to separate everything into a specific category: beauty products, medicine, hair products, etc., and then give it a specific home. You may need to buy some drawer organizers or bins to place everything in, but this way, you aren’t throwing your hair straightener in with your toothpaste. Before you begin putting everything away, get rid of anything that’s expired or that you barely use. This creates more space for everything that you do use. As you’re decluttering your home for the new year, you might find some trinkets that bring back memories but are taking up way too much space. If that’s the case, consider self-storage. It’s the best way to hold onto the things you love, while still keeping that decluttered home that you dream of. We’d love to help you out! Check out our storage plans and locations here.